The most common vector-based models of surfaces are contours and TINs. Source data may be provided in either of these formats, or may be converted to these formats from DEM files. Typically they are far more compact than DEMs, but less suitable for analytical methods, and TINs may result in a significant loss of information unless the underlying surface is of triangular form. TINs are widely used in engineering modeling (they are the principal form of surface model in Autodesk’s Land Desktop package for example). Since DEMs may well have been generated from contour datasets, reversing the process may not result in the same pattern of contours, depending on the algorithms used in each case. Contour creation is described in Section 6.5.3, Contouring. 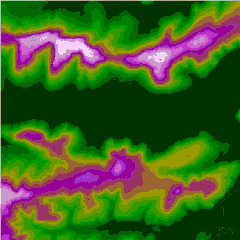 Figure 6‑5A‑C shows the test area source DEM together with derived contour and TIN representations, created using the Landserf package for the TQ81NE test region. The TIN example is based on a program selected set of 500 vertices, resulting in approximately 1000 triangular regions. The representation is not unique, and a similar computation using another package (e.g. 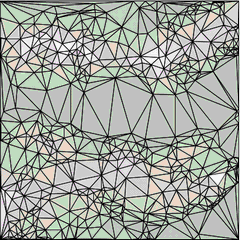 TNTMips, which uses a similar method that it calls adaptive densification) may result in a different pattern of triangles. Note that representation of flat regions with the TIN model can be problematic. The generated models may be used to re-generate an approximation to the source DEM as shown in Figure 6‑5D — the differences between the TIN-generated DEM and the original DEM can be plotted as a grid, as shown in Figure 6‑5E. The darkest reds are the areas of maximum “error” — in this case up to 10m. The error map can be improved (the quality of the TIN representation enhanced) by increasing the number of vertices. Note that this is not the same as the difference between the TIN and the true surface, which in principle can be computed everywhere. 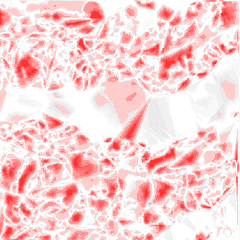 TIN creation from DEMs benefits from a level of feature extraction in order to produce the most efficient description of the surface (i.e. 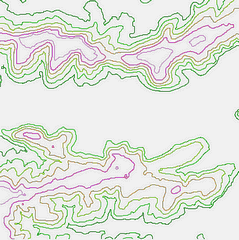 with minimum surface error and inclusion of key surface features, such as peaks, pits and ridge lines). However, such facilities are rarely provided in TIN-generation algorithms as noted earlier (Section 4.2.14, Tessellations and triangulations). 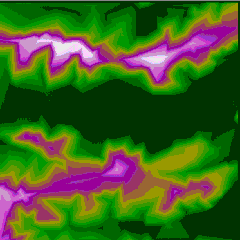 Pure feature-based vector models, which are essentially networks of polylines or curves linking peaks, pits and passes or saddles along ridges or channels are sometimes computable as output from GIS analysis tools, but are not provided as a standard form of vector representation (see Rana and Wood (2000) and Rana (2004a) for further discussion of this topic). Figure 6‑5F shows feature network extraction from the source DEM. The level of network connectivity, and hence surface representation, obtained by such methods will vary depending on the values of user-definable parameters that are set, and on the nature of the surface itself. The factors are in addition to the computational problems we have alluded to.